Tuvans could see total solar eclipse on March, 29, for almost 2 minutes. From the early morning the sky was cloudy and people were desperate not to miss an extremely interesting astronomical phenomenon. 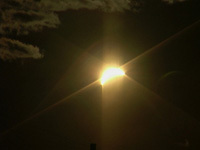 But just before 7 p.m (local time) clouds partially broke up and at 7.45 p.m. the Moon was slowly covering the Sun. It was fascinating. 'Magic' whispered people. Cars stopped. But one should have 'caught' a sight of the eclipse running from one spot to another as it was not seen from everywhere. Kongar-ool Ondar is turning today 43. The remarkable Tuvan throat-singer is celebrating his birthday in USA, where Tuvan ensemble 'Alash' made up of his pupils is touring. The group is foing well in America, they've had quite a few concerts and they've all been well attended. 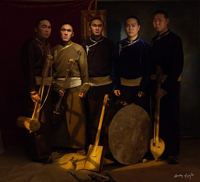 The boys are all in a good mood but of course they miss their loved ones back in Tuva, confessed musicians in an interview. Kongar-ool like always is worried and in a hurry to get home, because on the 13th of May this year he will be putting on a khoomei-competition dedicated to his countryman Maxim Dakpai. Sherig-ool Oorzhak came back from China which he visited as a member of the Russian official delegation headed by Vladimir Putin. In his absence Tuvan parliament adopted an address to the Russian President attracting attention of the state head to Oorzhak's ineffective rule which led to the present poor economic condition of the republic. Opening for the 12th time, the Golden Mask festival presents its annual showcase of the best of the best in Russian theater. It comes around now with the precision of a fine Swiss watch. It has become so predictable and so reliable that one might be excused for thinking it's just another element of nature; one of the little gifts that spring invariably brings -- like the first green buds or the last clumps of dirty snow. It is the Golden Mask, the festival that brings to Moscow an array of the previous season's top accomplishments in theater from all over Russia. 13 Tuvan deputies (12 votes are needed to make a special resolution of it) voted for the Address to Vladimir Putin in which they wrote of the poor condition of Tuvan economy mostly to the ineffective rule during the last 14 years by Sherig-ool Oorzhak. The last drop which overfilled the bowl of deputies' patience was the latest semi-secret privatization of the biggest market center in Tuva - Garuda. State-owned trading centre was sold at 2,5 million rouble (80 000 dollars) which is an inadequate price for such a property. Russian vice-prime-minister, defense minister Sergei Ivanov speaking of the patriotic upbringing of the younger generation mentioned that sometimes 'in news-papers alongside with a good article one can see ads of services rendered by prostitutes, shamans and other cheaters'. This sentence did not go unnoticed. Supreme shaman of Tuvans, doctor in history Mongush Kenin-Lopsan wrote a letter to Ivanov, copying it to State Duma, Council of Federation, in which he underlined that shamanism is a traditional belief of many ethnic minorities, shamans are respected members of the Tuvan society who help people and it is not proper from a high-ranking official to offend representatives of shamanism putting them in the same row with prostitutes and 'other cheaters'. Several hours left to change the situation. Vera Bailak, 81, legendary Tuvan war veteran, whotook part in liberating Ukraine villages from fascists in 1944, mother of 11 children, head of the huge farm, still on horse-back when needed, is among the nominees for the Siberian of the Year. Today is the last day for voting. Difference between all the 32 pretenders is minimum. Tuvan Vera is missing just 40-50 votes to be in the 7 leaders who will be declared Siberians of the Year. Our Albert Kuvezin is in the leading 7. Vote for Vera withing the nearest hours and make all your friends and friends of your friends do the same at www.sib21vek.ru! 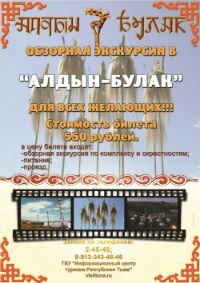 Tuvans Vera Bailak and Albert Kuvezin Missing 100 Votes to be Siberians of the Year! March, 22 is the last voting day which can bring them to leadership! Vote for Tuvans at www.sib21vek.ru! Make your friends do the same. March, 18 Fiodor Tau, 77, renowned Tuvan throat-singer died. He was born in the place of Sal in the Tes-Khem district on the 5th of September. He began practising sports, skiing mostly, while serving in the army in the 50-ties. Coming back to Tuva he did not drop skiing and became 12 times champion of Tuva in it. His record in the 50 km ski-race has not been improved. He confessed later to Tuva-Online that it is due to sports that he could throat-sing till very old years.